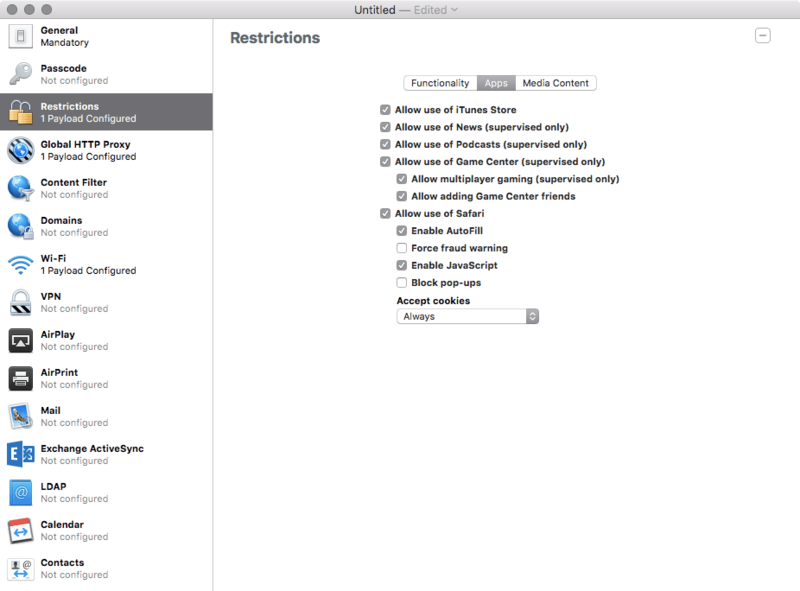 Built-in: Limit Adult Content: A basic profile that allows you to specifically whitelist and blacklist sites. This gives you very basic control of sites. Here, use the plus sign to enter a URL, as you can see here. Built-in: Specific Websites Only: This option only allows certain sites, and creates a badge for each in the bookmarks list of Safari. Plug-in: Allows you to install third party plug-ins on iOS devices. If using this, you would likely have instructions for building the profile from the vendor. 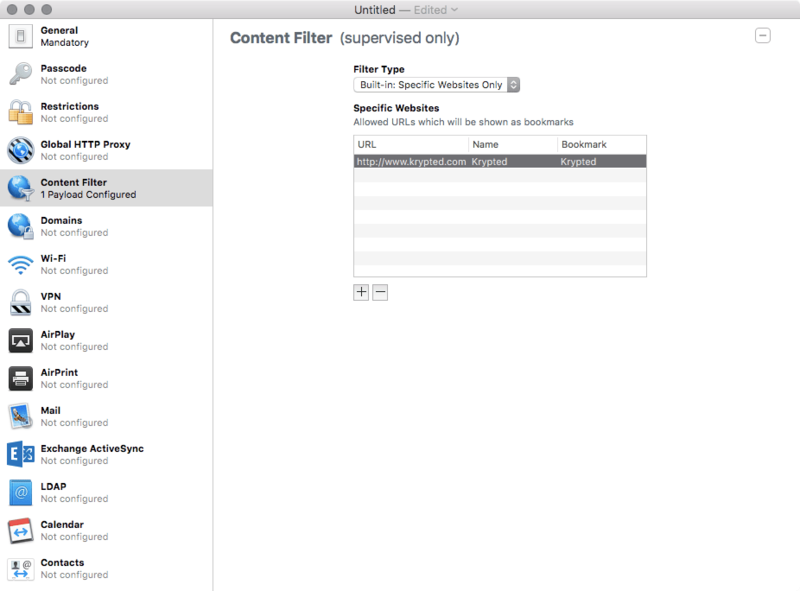 The Content Filter is a pretty straight forward profile, except when using the plug-ins. Close the screen to save the profile. Once saved, you can use the filter profile in blueprints, via an MDM solution, or install manually through Configurator. Use the Global HTTP Proxy In Apple Configurator 2 there’s an option for a Global HTTP Proxy for Supervised devices. This allows you to have a proxy for HTTP traffic that is persistent across apps, and to have that proxy applicable when users go home or if they’re in the office/school. If you have a PAC file, you can deploy the global proxy using that, by selecting Auto as your deployment option. 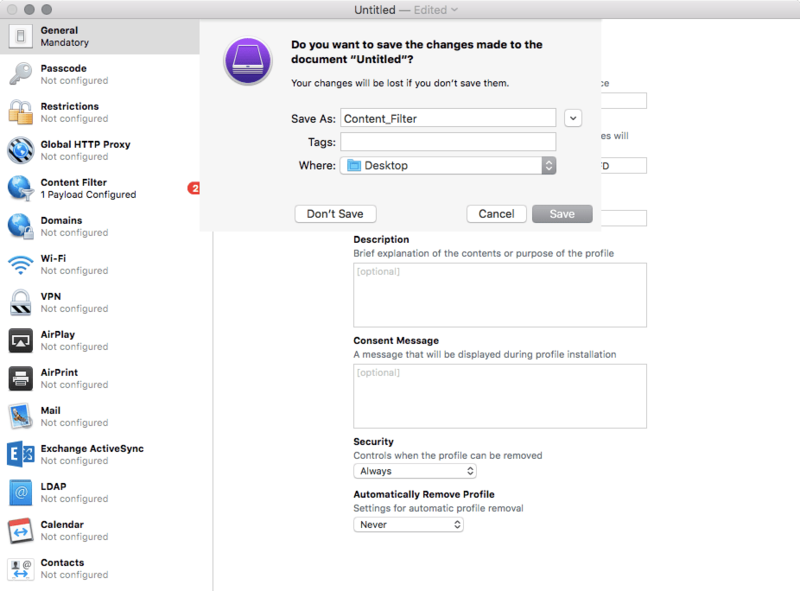 If you don’t use a PAC file, you can also manually define settings to access your proxy. Here, we specify the proxy server address and port, as well as an optional username and password. 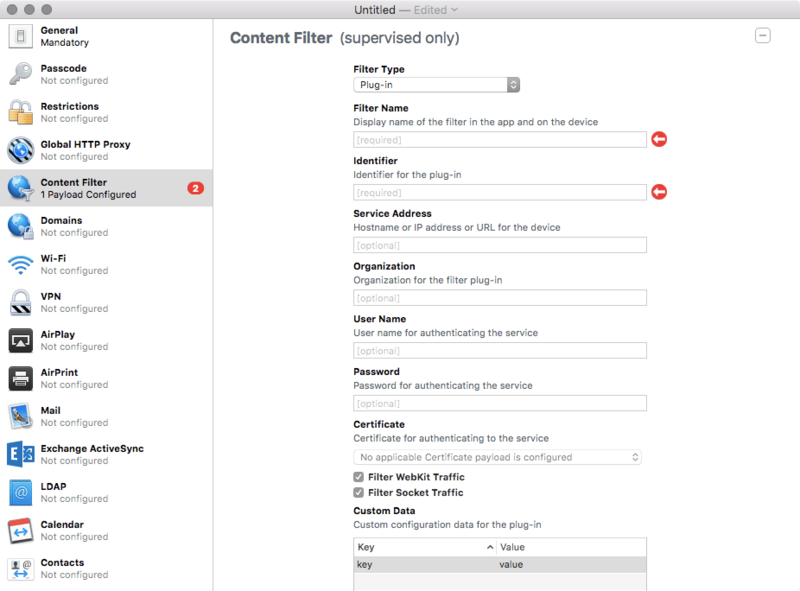 Additionally, new in Apple Configurator 2, we have the option to bypass the proxy for captive portals, which you’ll want to use if you require joining a network via a captive portal. Each Wi-Fi network that you push to devices also has the ability to have a proxy associated as well. This is supported by pretty much every MDM solution, with screens similar to the following, which is how you do it in Apple Configurator. I am all about layered defense, though. Or if a proxy is not an option then having an alternative is a great call. Another way to disable access to certain sites is to outright disable Safari and use another browser. This can be done with most MDM solutions as well as using a profile. To see what this would look like using Apple Configurator 2, see the below profile. Now, once Safari has been disabled, you then need to provide a different browser. There are a number of third party browsers available on the App Store. Some provide enhanced features such as Flash integration while others remove features or restrict site access. In this example we’re using the K9 Web Protection Browser. This browser is going to just block sites based on what the K9 folks deem appropriate. Other browsers of this type include X3watch, Mobicip (which can be centrally managed and has a ton of pretty awesome features), bSecure (which ties in with their online offerings for reporting, etc) and others. While this type of thing isn’t likely to be implemented at a lot of companies, it is common in education environments and even on kiosk types of devices. There are a number of reasons I’m a strong proponent of a layered approach to policy management for iOS. By leveraging proxies, application restrictions, reporting and when possible Mobile Device Management, it becomes very possible to control the user experience to an iOS device in such a way that you can limit access to web sites matching a certain criteria. This article is a pre-release chapter in the upcoming “Take Control of OS X Server,” by Charles Edge, scheduled for public release later in 2014. Apart from “Chapter 1: Introducing OS X Server,” and “Chapter 2: Choosing Server Hardware,” these chapters are available only to TidBITS members; see “‘Take Control of OS X Server’ Streaming in TidBITS” for details. Hope you enjoy! And thanks again to Adam and Tanya for their awesome editorial! Some iOS and/or OS X deployments require us to create a boatload of Apple IDs. This could be to redeem VPP codes, to do iOS backups, to configure Messages, now giving the ability for OS X Server users to password reset for themselves, etc. I have sat and manually created Apple IDs for a number of clients. I’ve created dozens at a single sitting and there are some serious annoyances and challenges with doing so manually. For example, you’re gonna’ fat finger something. If you type 10 things in for 50 accounts then it’s hard to imagine you’re not gonna’ mess something up in one of those 500 fields. It’s also time consuming and well, just annoying. Then, along came a script. That script allowed us to create loads of IDs on the fly. Now, we have a very nice GUI tool called the Apple ID Automation Builder that can be used to batch create a number of Apple IDs on the fly. Brought to us by Greg Moore and hosted by enterpriseios.com, this is one of those rare finds that is a serious time saver and very valuable when you need it in your bat belt. Great little tool, well worth the money and I look forward to providing Greg with plenty of accolades should we ever meet! 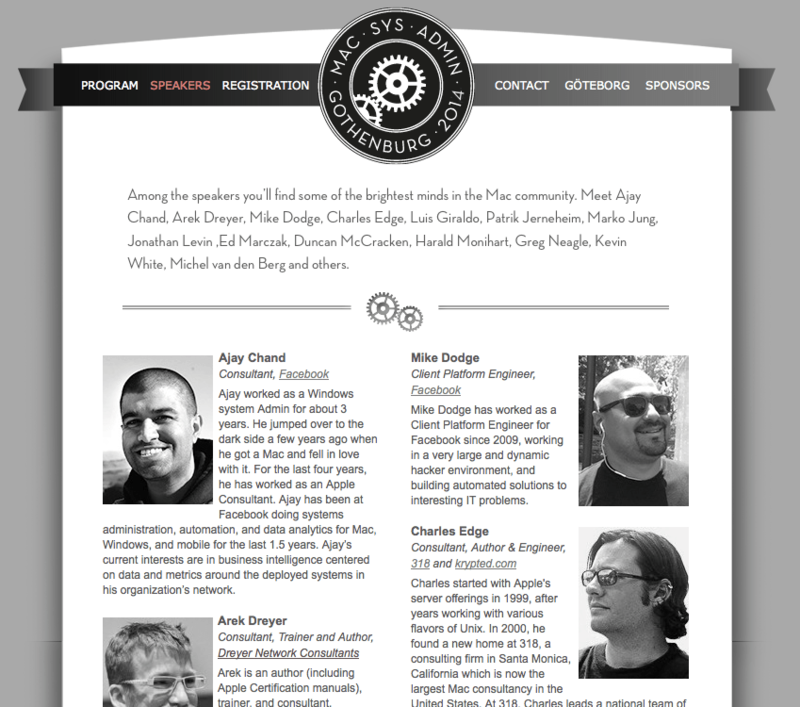 A special thanks to Nick McSpadden for his third submission to krypted.com. With all the new changes in OS X/Server I haven’t even had time to write as many in such a span!!! A postinstall script for Firefox that guarantees the establishment of the symbolic link between the CCK location and the internal Firefox bundles directory. A package for the CCK itself that drops the items in the location you want, with the appropriate installs key to ensure it reinstalls if deleted. The CCK package should also establish a symbolic link to itself if one does not already exist. A guaranteed reinstall of Firefox, should it be deleted, that also incorporates the re-establishment of the symbolic link. We do it this way to guarantee that the CCK is always linked to the correct place in Firefox, even if Firefox is updated, or installed separately. Since Firefox always creates the symlink as part of its install, we don’t have to worry about it breaking if the user deletes Firefox, or Firefox gets updated to a new version (which won’t have the directories or symlink inside it by default). The CCK will only get reinstalled if it’s missing from the /Library/Application Support/ folder (or wherever you initially stashed it). This way, as long as the CCK is listed as an update-for for Firefox, you’ll always guarantee that the correct Firefox management is installed. The only thing you need to remember to do is copy the postinstall_scripts to each new version of the Firefox and CCK pkginfos (although the CCK pkginfo will need a new checksum if you make changes).